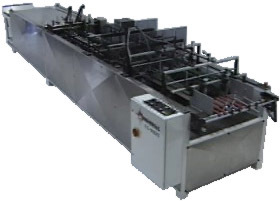 The Universal Line includes the F/G Series, a fully automated, high speed line of folder gluers and side seam gluers that give you the option to run high speed pocket folders, CD's, Straight line and Lock Bottom Cartons. Customize your unit with the available options: Rotate, Perforate, Score, Inserting, and Duel Steam! F/G Series is also customizable for your unusual or difficult projects. Also available is the PFG series of Pocket folder gluers. Designed with the low volume or beginning finishers in mind. Suited for small to medium runs and fully upgradeable from hand-fed to automatic. Universal Folder Gluer will get your job done! Copyright © 2005 Universal Equipment Company.